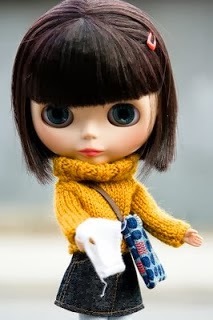 Hello people who read my blog!!! "Kiki's Art" is now a new thing. From time to time, I will show you art pictures that Kiki makes. This picture is about a sunset. I don't know why Kiki drew it, or where she got inspired from, but she drew it then showed it to me. Now here I am blogging about it. This is the 1972 Original Blythe commercial... I think. I think it is cool, and it has a catchy song. 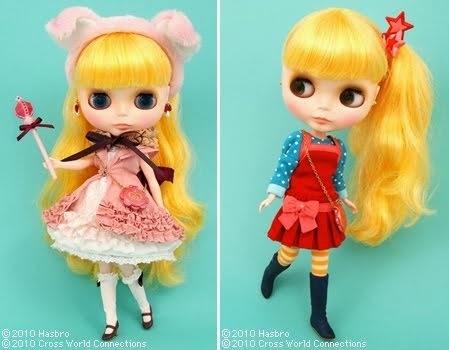 I like the blonde Blythe the best. But I like the rest too. Just so you know, this is not my video, and it's not on my channel. Q: If a plane is flying from New York (In America) to Morocco (In Africa) and crashes, where do they bury the survivors? Q: What do you call a crazy duck? P.S. The writing on the pictures says "Peaches is adorable!" Peaches wants to be an author of really great books, but has no idea what to write about. Peaches wants to be remembered after she dies, like "Doctor Seuss." Peaches loves reading romance novels, so she wants to write one of those. Kiki wants to illustrate a children's book, and wants Peaches to write it. Peaches has no interest in that whatsoever. Peaches wants to write a post for this blog, and she wants to write a poem in the post. Q: Why was the library so tall? A: Because it had so many stories! These are some random pictures of PeKi, at random parts of their lives. 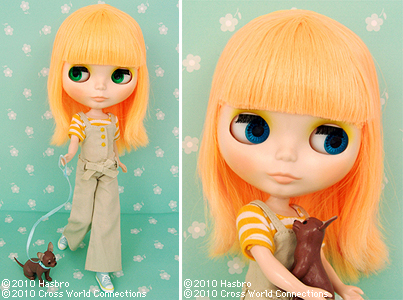 In the first pic, Kiki is wearing her uniform from her Ice-Cream shop job. In the second pic, PeKi are showing you that their presence is a gift. In the third pic, They are just desperate to get their pic taken. PeKi look really good in gift bags, in my opinion. The gift bag's main colors are purple and yellow, which are Peaches's favorite colors. Q: Johnny's mother had three children. One named "April," One named "May," ...what was the third one's name? Peaches is surrounded with clothes, and wearing hats. Thus the title "Clothes & Hats." Q: What can go up the chimney down, but can't go down the chimney up? I am going to tell you about my three all time favorite blogs and why I like them. 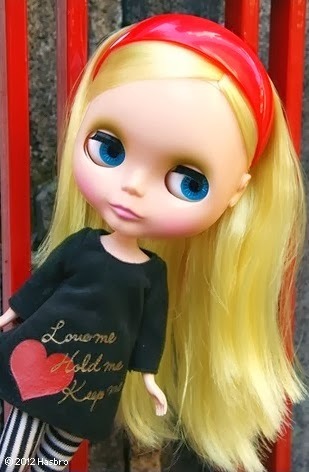 Up above is a pic from "Bella and Blythe." The reasons I like "Bella and Blythe:"
There were cool posts up everyday, (Why I say "Were" is because she doesn't post on that blog anymore). Up above is a pic from "Life of Blythe." 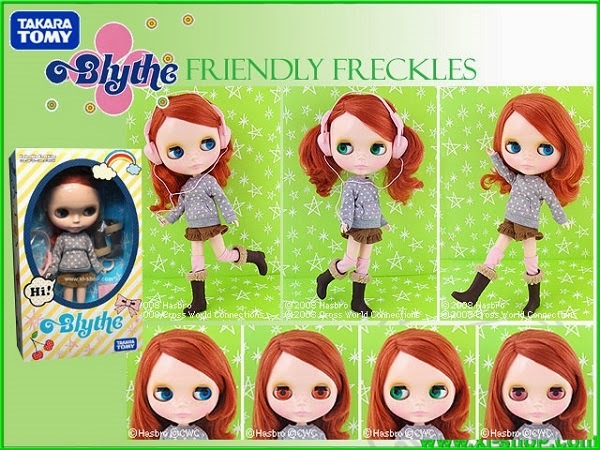 The reasons I like "Life of Blythe:"
Her second Blythe's name is "Kiki," just like mine! She posts about a lot of cool things. Up above is a pic from "The Adventures Of Molli." The reasons I like "The Adventures Of Molli:"
I think the family who owns the blog is vegan (Like me!) or vegetarian , because in one of her posts, she mentions a feast with Tofurky (Fake meat). Q: What did the cow say when he fell in a well? Hello! This is peaches in a Blanket Burrito. Cute and funny. Lol. I think it would be a cool idea to start posting jokes or riddles at the end of most of my posts. The joke will be right before my signature. Q: How do you make time fly? A: Throw a clock out of the window! 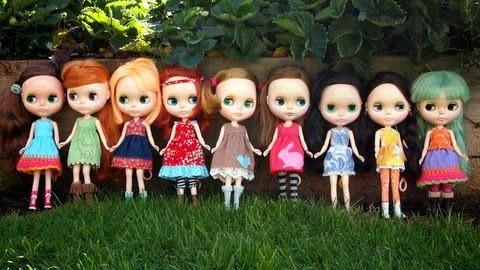 Here are some Blythes that I don't have that I think are cool. 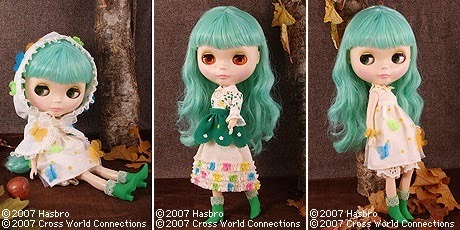 I think a lot of Blythe dolls are really cute. There is a really comfy chair in the house called "Bob Moss," (Yes, the chair has a name), and Peaches has taking a liking to it. and took a nap on him. The cat next to Peaches is named "Sabrina." Sabrina is Peaches's cat. Kiki and I decided to get a little creative, so we made a basketball hoop. We made it out of a large doll stand and a yogurt cup. We just used some mini rubber balls for the basketballs. Kiki loves playing basketball, and she also loved crafting the hoop. Sorry I didn't post yesterday, but I was busy. PeKi and I went to a cool nature reserve place, and we loved it. PeKi stopped to sit on a rock. It was cool, and comfy. Kiki liked it because it was really high up. Peaches liked it because she was walking a lot and she needed a rest. Below the rock, there was a really soft plant that was also really furry. I was going through some old photos, and I found one of Peaches. I took this photo before I even had Kiki. In the photo, Peaches is standing next to her bunk-bed, which I covered in yarn. I liked it when it had yarn on it because it was cool and strange. It also had a place to hang her shoes! You can even see the shoes hanging up on the top! The bunk-bed is really supposed to be a hanging bookshelf, but I made it into a bunk-bed instead. Peaches and I went to the Library, and there was a cool patio there. On the patio, there were a group of metal deer. There was a Father deer, a Mother deer, and two Fawns. The fawns were adorable, and so were the others. Peaches liked riding on the Father Dear's antlers. Peaches really enjoyed being there, and hopes she can go again soon. 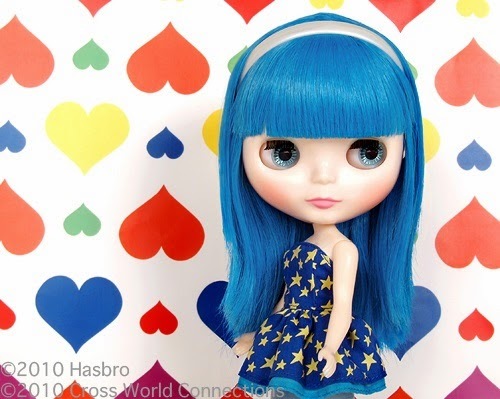 This post will be about My Beautiful Blythe, Kiki. Kiki is really awesome, and I am lucky to have her. She loves to watch or be in Car Chases. and she loves to meet new people. I got her in May, 2012. None, like Peaches. She doesn't really want a social life. Color: Pink! Like her hair! Holiday: Birthdays (Especially huge parties). Thanks to my readers for reading my blog! You are all AWESOME!